A tenth grade English teacher attempts to unite feuding schools by launching a pen-pal project. Best friends Cassie, Emily and Lydia initiate the correspondence, and are answered by Matthew, Charlie and Seb. Emily and Lydia are more than pleased with their matches, but quiet Cassie has a frightening experience with Matthew. When Lydia and Emily discover that Matthew has threatened their fragile friend, the Ashbury girls close ranks, declaring an all-out war on the Brookfield boys. Soon, the couples are caught up in everything from car-jacking and lock-picking, to undercover spying and identity theft. First, can I just say that I was reading this right about the same time as I discovered Sherlock (See my review here) and I so want Jaclyn to be related somehow to the famous Moriarty. Even if he is fictional. I don’t care! If I had to make a sweeping generalization about this book, I’d say that it is the perfect “beach read” – Light and fluffy, but not to the point of being gag-worthy. One more review today! Iron King by Julie Kagawa. Now off to do a little homework before it turns into a pumpkin. The Summer “Beach Reads” Challenge ends today and I still have three reviews to finish! Plus I have to go to school and … well I’d better get started! Grace, 17, loves the peace and tranquility of the woods behind her home. It is here during the cold winter months that she gets to see her wolf—the one with the yellow eyes. Grace is sure that he saved her from an attack by other wolves when she was nine. Over the ensuing years he has returned each season, watching her with those haunting eyes as if longing for something to happen. When a teen is killed by wolves, a hunting party decides to retaliate. Grace races through the woods and discovers a wounded boy shivering on her back porch. One look at his yellow eyes and she knows that this is her wolf in human form. Fate has finally brought Sam and Grace together, and as their love grows and intensifies, so does the reality of what awaits them. It is only a matter of time before the winter cold changes him back into a wolf, and this time he might stay that way forever. A lot of people have been reviewing this one (or rather its sequel Linger), and I thought it looked decent so I decided to order it from my local library. While I can see the attraction for a lot of people, it wasn’t my favorite book ever. First of all, there were some things that just felt slightly off to me. This book is a lot like Twilight, which is probably why a lot of people like it. In its favour, Grace has a little more personality, and I like that she’s a go-getter who comes up with solutions to problems, even if the solutions aren’t right. But to me, she’s still got a little of that “Bella = pushover” flavour to her. She sees Sam wounded, decides to help him and she’s instantly “in love and there’s never going to be anyone else!” That just doesn’t ring true for me. As much as I’d like to believe in “love at first sight” this just feels, to me, like teenage puppy love. Add to that the fact that they never get into a fight or disagree strongly on anything, and it just doesn’t feel like a real relationship. Real relationships don’t just happen – you have to work! On the other hand, I really enjoyed the ending of this one. As the Twilight series came out, I had certain expectations and hopes for the ending, none of which were fulfilled. I even considered writing fan-fiction to “fix” the ending, because I felt it just wasn’t right. Shiver does exactly what I wanted Meyer to do at the end of Twilight. I’m not going to spoiler or anything, so don’t worry about that, but I love the fact that someone else has written a book to replace the Twilight series, which I felt let me down in so many ways. 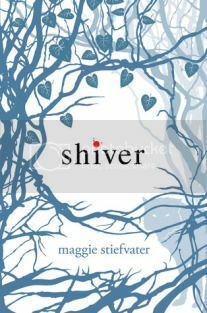 So, if you like Twilight, I would definitely recommend Shiver. If you didn’t like it, I would suggest at least trying Shiver for all of its redeeming characteristics. At the moment I don’t. This is a lot because I’m not a genius with technology by any stretch of the imagination so I don’t actually know how people put those cute little rating guides with pictures of keys or teacups or whatnot in the sidebar. This is also because I have yet to come up with a clever idea of how to rate things – stars are kind of unoriginal, but how can I relate it to creativity? (That’s only half rhetorical by the way.) What is a single unit of creativity and how could I represent it in a picture? Finally I can give a review that’s not just listing good things! I feel like I’ve been a broken record, just finding the good stuff in the books I read. Before I get into the stuff I didn’t like, let me just say that Jasper Fforde is one of my favorite authors. I love both his Thursday Next series and Nursery Crime series. When I heard he was writing a new novel I was really excited. Besides, the premise sounds so interesting! A dystopia based on what colors you can see? Isn’t that clever? My main problem with the novel wasn’t that it didn’t live up to my expectations – it was that it left me confused. I spent nearly the first half of the book trying to figure out what was going on, and the second half trying to catch up on everything I managed to miss while trying to figure out the first half. I didn’t like that. With someone as clever as Fforde writing, I expect some deeper meaning. Even the fluffy satires that he usually writes are written for more than just entertainment. This time I spent so much time just sorting through the plot points and rules and regulations of the colourtocracy that I never managed to even scratch that surface. That said, I think the novel really is quite clever. Once I began to understand the colourtocracy and all its seemingly arbitrary rules, I was amazed. The mind that created this society must be absolutely genius. I would love to just meet Fforde once and sit down and have a conversation with him. I’m sure it would be fascinating. And you can tell this wasn’t just a “oh wouldn’t this be cool!” kind of idea. He must have sat for hours just working out the details. I think in the end, the jury is still out on whether or not I like the book. I’d like to read it again. I think a second reading will give me a different perspective, and perhaps a different opinion. But for now, I’ll say if you decide to read this book, prepare to be confused. I am an awful blogger. It’s been nearly two weeks and all I’ve done is the Book Blogger Hop. Sure, it’s the first week of school and my schedule is nuts even without the fact that I haven’t entirely figured it out yet (results for auditions went up last night – I got what I wanted, picc in orch YAY, but that means I now have to actually decide which class I want to drop. See I currently have two courses that are very similar that count for the same requirement, but one of them I couldn’t take if I was put in band because it’s the same time, so I signed up for both, figuring I’d drop whichever I couldn’t take. But now, my schedule will allow me to take both. Therefore I have to decide which I’d prefer. Major dilemma.) But that is no excuse. My pile of books to be reviewed keeps growing – one thing I love about school is all those tiny little 10 minute windows you get to sneak a few pages. So. I am going to post once a day now until I finish reviewing the books on my “finished but un-reviewed” pile. It’s part of my homework. So, on to what we came for. One of the things I loved about this book was how different it was from my normal fare. 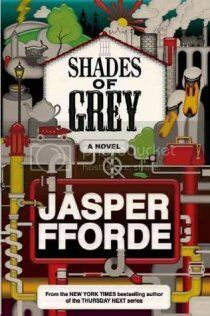 When I received it (as part of Candace’s mini-tour) I was right in the middle of Shades of Grey by Jasper Fforde. Normally his stuff is just fun, fluffy thinkers that take no time at all, but Shades of Grey was really heavy and I needed the break. Within 24 hours of receiving the book I’d finished it. 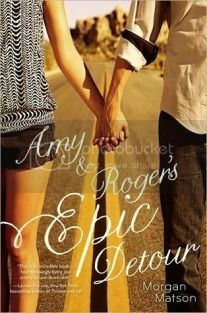 It was a fast, easy read, breaking up the prose with fun “pages” from Amy’s travel diary and Roger’s playlists. After a novel that made my head hurt every few sentences, this was what I needed. I guess what I’m trying to say is that this book does what I wish books would have done when I was that age: treats Young Adults as young adults, not as kids. Actually I only follow about 16, and 4 of those aren’t even about books. This is because I’m very picky about who I follow. I already don’t have enough time to read through every post on the blogs I follow. That’s not to say I don’t love other people’s blogs. But especially with book blogs, if I don’t think I would enjoy reading the types of things you review, I just don’t follow you. I might check in every once in a while, just to see what kind of cool things you’re doing. But I don’t follow “just because.” Sorry if that makes me a few enemies – I just don’t deal well with backlogs and clutter, and this is one way to keep it down. So, interesting things happening around here! Candace over at Candace’s Book Blog is hosting a 400 follower giveaway for which she asked us to show her our shelves. It’s only until Sunday, but I was away when the contest first started, so I wasn’t able to take pictures of my shelves and post them then. So, I’m posting them now! These are my main shelves. They get me through about half the alphabet and as you can see they’re already overflowing. This is my newest addition. Homemade last year just before I left for exchange (I think I put them up about 2 days before I left) and already full. This is the remnants of my old bookshelves – I still haven’t managed to get everything out of the closet and into my room, though I’m getting closer, and I got all the important stuff. This small set is meant to be my TBR pile, as well as books that I use but aren’t reading books (like my sketch book, and a few sudoku or other puzzle books). At the moment my TBR pile is all over my floor. What can I say, I’m a bit of a slob. And finally, the newest ones, also homemade, set to go up today. These aren’t exactly bookshelves, but they’re going to take all the knick-knacks off of my dresser so I can change which dresser I have, and therefore have more room for bookshelves. I also have one more set of shelves, not pictured, for CDs and DVDs which is pretty much overflowing as well. I have got to find more shelf space somewhere! So, there’s my shelves. What do yours look like? I find this a very difficult question to answer. If you mean physical books, only about a handful, because I just got back and haven’t had a chance to have a proper wander around the library and get my usual stack. On the other hand, if you mean “all the books I have on my list even if I don’t happen to have them in my house” then WAY too many to count. I started a list last year in a small notebook, because I was constantly forgetting what I wanted to read. This notebook didn’t go with me, so I hardly worked on it at all, and it’s still about 6 pages long. Plus, I started a new list while I was gone that still hasn’t made it home yet (I had to post stuff, due to weight limits on the plane). So yeah, lots. My first non-book review! This is the piece of shiny-ness that has been distracting me for the past few days, and I just had to share. Review: I’m not much one for crime drama. I have several friends who are into the genre (one is a CJ major – hard for her not to be really) so I’ve gotten used to it, but if I have the choice of what to watch, I’m unlikely to pick CSI or something like that (with a few notable exceptions like Castle). I wouldn’t have looked twice at Sherlock, despite the famous main character, with just that summary. Then I found out it was done by Steven Moffat. Now I’m not obsessed enough that I immediately went running to find a copy, simply because it was written by the same guy who writes Doctor Who. But a few days later I was bored with nothing to do, and decided to go and watch it. Am I ever glad I did! The premise is a simple “what if?” Take the Sherlock Holmes that everyone has heard of and place him in our time. Let him wander free and see what he does. It’s a novel idea, funnily enough. Sherlock Holmes has been made into a film countless times, but never quite like this. I can see some die-hard fans saying this is blasphemy, but I think it works. It shouldn’t. But somehow it does. I will admit, the first scenes are quite off-putting. 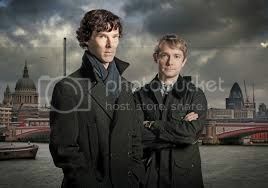 Watson seems a bit dull on his own, and Sherlock seems a bit like a maniac with a riding crop (I mean, honestly, who beats dead bodies with a riding crop for research?). If it weren’t for Molly’s obvious crush on him, he would seem a wholly alien, pretentious, arrogant, unfeeling… well you know. And yet somehow, when he gets going, putting together all those little facts that we all would have noticed, to make a picture we should have seen all along, you can’t help but love him. Put him together with Watson, who really is a bit smarter than the rest of the average Joes, though Sherlock doesn’t see it, and you have some really interesting stuff. Sherlock needs John, in the same way that the Doctor needs companions (sometimes I think more – the Doctor tries harder to be human simply because he isn’t). He needs someone to remind him to be human. And to eat every once in a while. I think a lot of the amazing-ness comes from the dialogue. It is well written and Benedict Cumberbatch (apparently the only man to ever play Sherlock with an even more ridiculous name) rattles them off in such a quick and snappy manner that you can’t help but believe it’s really him coming up with the stuff instead of reading off lines. He really truly becomes Sherlock. You believe in him so much that his glee in solving a murder isn’t disgusting or unnatural, because you’re getting excited too. And when it comes to becoming Sherlock, of course, the costuming helps – those costume designers must be geniuses for how well they were able to make us see the Victorian and yet not have it clash with the Modern. In fact, it worked so well that I was surprised when we saw Sherlock in his dressing gown for the first time. If you saw Sherlock on his own in any shot, aside from minor changes in the cut of his suit, you would not be able to tell he was from modern times. And yet, surrounded by people dressed in “normal” modern attire, he never seems out of place. Of course, as a music student and film music enthusiast, I couldn’t do a review of a film without at least mentioning the music. In this case, though, the music deserves more than a mention. It’s what ties the film back to the original Victorian setting the strongest. The composer uses both the beat of the modern pop/rock song, and the banjo/guitar riffs that are almost always associated with a film set in Victorian times and they make a perfect mesh, overlaying the background and smoothing over the gaps. It does exactly what it’s supposed to do without drawing the (average) listener’s attention away from the action. But at the same time, the music is gorgeous on its own. As I type this, I’ve got the 30 second intro playing on constant loop. You’d think I’d get bored of the same 30 seconds over and over again, but I haven’t yet and it’s been playing for the past 2 hours or so. It’s that good. Now, after all that glowing praise, I feel I have to put a warning on this review. The final episode leaves you hanging off a cliff. Almost literally. It went to the credits and after staring at it for a few seconds to make sure it wasn’t a fake out, I started screaming at the screen. You will want more. Yes, even if you don’t love it as much as I do. The only way I’ll tolerate an ending like that without screaming is if I know the next episode is coming within the next week (OK, so I’ll whine a little bit, but really cliff-hangers just aren’t fair!) You will hate Steven Moffat for leaving you this cliffhanger without even a date for resolution. Even so I highly recommend the show. My words cannot do it justice. Go watch it! I am really not good at this whole “Catching up” thing. Normally I don’t have quite so much trouble, but unfortunately this time I got distracted by some new amazing shiny-ness, which I will be reviewing soon. Luckily, I haven’t finished any other books yet, so I’m not technically too behind on this, but I need to get caught up. So on to the next review! A murder mystery novel like no other. The detective, and narrator, is Christopher Boone. Christopher is fifteen and has Asperger's Syndrome. He knows a very great deal about maths and very little about human beings. He loves lists, patterns and the truth. he hates the colors yellow and brown and being touched. 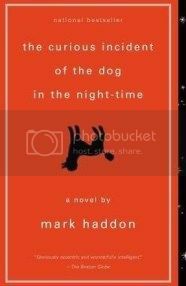 he has never gone further than the end of the road on his own, but when he finds a neighbor's dog murdered he sets out on a terrifying journey which will turn his whole world upside down. 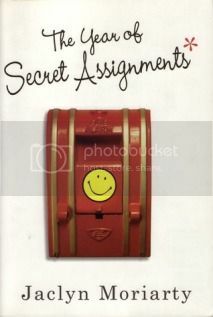 This book was hard for me. Not because of the topics or anything, but because of the style. Anyone who knows me will tell you that I like my grammar etc. right. It grates on my nerves when something is out of place, almost like an OCD reaction. I have this innate need to just fix it. On the other hand, I think the style was some of what made this book great. If the grammar and writing style hadn’t been slightly off it wouldn’t have made sense, and in fact would probably have grated on my nerves more. I am so glad I didn’t read this book sooner. I’ve had it recommended to me, by various people who loved it, since high school. It wasn’t until I finally was given it for my birthday that I decided I would have to, at some point, actually make time to read it, instead of just telling myself that someday I would get around to it. But, by waiting, I ended up being in the right mind-frame to read it. Though I have nothing against people with difficulties, previous to this year, I always found it difficult to deal with them. I never really understood what was going on (and probably still don’t) but now that I’ve gotten to know two young boys with autism (I babysat for them regularly through the year) I have a better perspective. I have learned to remember that they are just people and the rest doesn’t matter. I think I was therefore able to handle the general style etc. better because I had a better idea of what I was dealing with. But I think the best thing about the book is the way it makes you think. None of us really know what it’s like to live in a world where people don’t understand the way we think and what is important to us. It is much too easy to just ignore it, as well, and this book will not allow you to do that. Instead it forces you into the mind of someone you don’t understand. It puts you on edge. Some wise philosopher (forget his name now, but we learned about him in Sophomore English – thank you Mrs. Dunn!) said that the only way to learn was “Cognitive Dissonance” or basically, things that make your brain hurt. Well this book will make your brain hurt alright. Even though it is not my favorite book, and I will probably never read it again, I would recommend this book to more mature YA readers.